A family portrait, though not all of the family could make it into the picture. It all starts with the Club Classic standard chassis. By designing a chassis that can accommodate 4 different output tube configurations, two rectifier options, three power (transformer) options Club Amps is able to offer custom sonic signatures to our clients. This photo shows the 20W, 30W and 50W Series I options. Notice that the transformers get larger as you look from front to back. The front and rear have tube rectifiers. 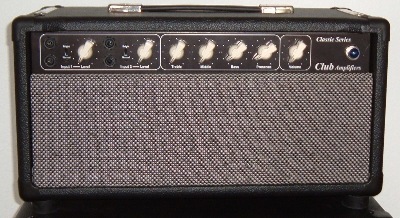 In total there are over 80 tube/transformer/sonic options. 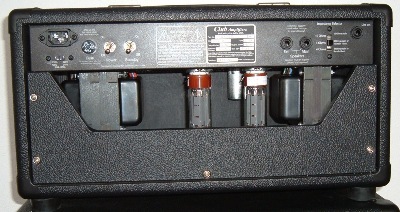 Club Classic Head-Series I. Each product in the "Classic" series is available with a 20W (15-22 actual Watts), 35W (30-35 actual Watts) or 50W (45-60 actual Watts) chassis. The Series I chassis will only be available for awhile. When current inventory is gone they will become part of history. Series II. The sonics don't change, but there are some improvements. 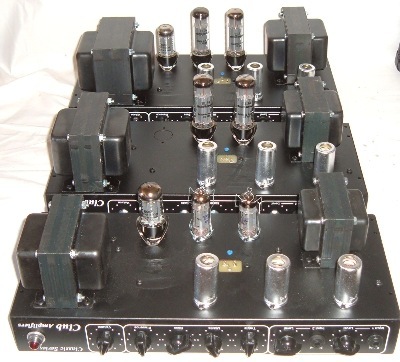 Each input channel has two jacks; the top being full gain and the bottom having 6db (or more) of attentuation; better for managing the input level before compression occurs. Each input has a bright/normal option. Since Club Amps are custom the artist can decide how "bright" they want "bright" to be. Series II...rear view. Like the Series I, the Series II has a power and standby switch, main and extension speaker jacks, and an impedance selector for 16/8/4 Ohms. The Series II also has a power selector switch for 120V/240V and a line out jack. This is 60W EL34, by the way. For the reverb model there's a footswitch jack. A 1x10 combo, smaller than a blackface Fender Deluxe. 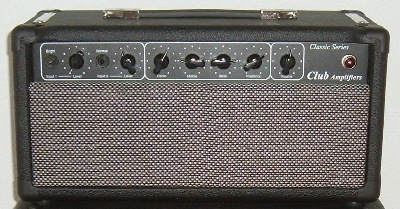 This "micro-combo" can be ordered with the same power options listed for the heads. With a 50W chassis and custom high power 10 inch speaker it's been nicknamed the "Little Monster" and "The Little Amp That Could". Available with Classic American (5010A), British (5010B) and "Velvet Crunch (5010C) voicing; VERY POTENT! Shown here a 1x12 combo stacked on a 15 extension cab. This is just slightly shorter than the Club half stack shown below; only a few inches. It is seriously loud, but much easier to haul from gig-to-gig. At Club Amplifiers we are very big on volume control by speaker choice as well as power. 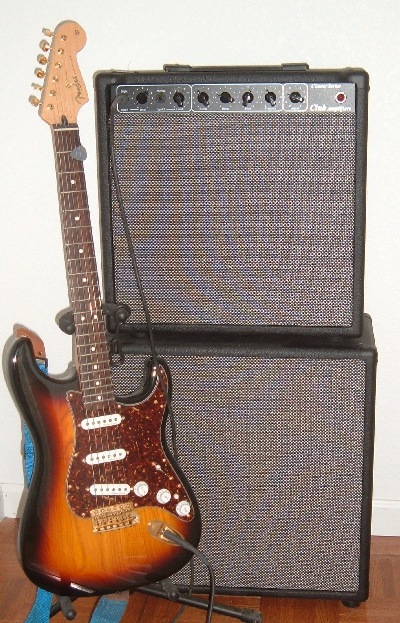 A 35W or 50W amp with a 10 inch or 12 inch speaker will be loud, but it can be operated at near full power to get that nice rich vacuum tube sound (rich with even harmonics) that you bought your tube amp for in the first place without shattering your ear drums. And, it's really easy to transport to the studio or small/medium gigs. Stack it on a 15 inch extension cab as you see here and you've still got a nice tidy package, but now you are moving a lot of air; much louder for bigger gigs. The "Club Stack". 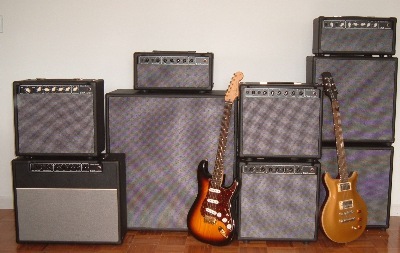 This stack features two 1 x 15 cabs. Of course, for smaller gigs only one cab may be needed. This will allow you to run your amp near saturation if you want to enhance earthy even harmonics while still keeping the volume level "sane". And, it's possible to mix and match 1 x 15 cabs. Our new custom from Eminence "standard 15" covers many musical styles, from blues to rock to British to country to jazz. Or, maybe one "American Classic" cone and one "Velvet Crunch" retro-50's straight cone for a great mix of mid projection and earthy crunch. 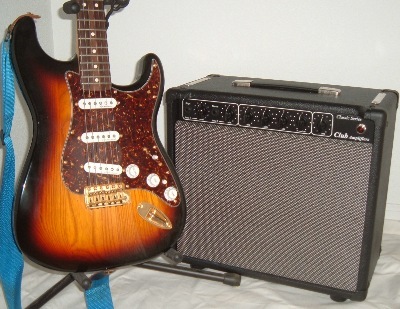 Maybe one British voiced Weber "Thames" or Celestion "Fullback" for mids and highs and one "American Classic" cone to get a bit more bite and crunch. This stack has 85-90% the volume (loudness) of a half stack, watt-for-watt. Try hauling a half stack in a Toyota Corolla. This whole stack will fit in the front seat of many cars. The Classic Twin combo. No, it's not the famous Fender Twin. The Club Twin series features 2 speakers. Shown here is a 2x10 combo. 2x12 is also available. 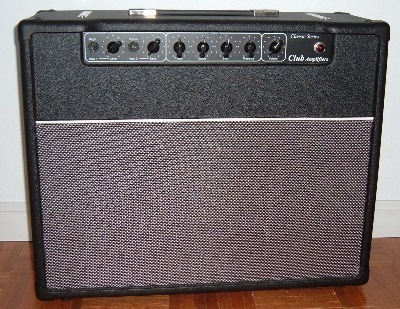 Classic Series-Very compact and "uncomplicated" with the classic core configuration of a 1959 Fender Bassman or Marshall JTM-45, very quiet with superior transformers. Available in head and combo configuration. Please note that this is not a copy of the '59 Bassman or JTM-45. There are many suppliers of Fender and Marshall clones. We are not one. The Club Classic series draws upon the features of these two classics to make a "Classic" of our own. For the contemporary musician who uses a pedal board rather than "built-in" effects to shape their sound the Classic Series is a great choice. Speaker Cabinets-We offer speaker cabs to match the sonic signature and cosmetics of your Club Head. We don't really want to be in the speaker business, but speakers are very, very important to how you sound and we want you to sound great! So, we offer speakers reluctantly, yet with great pride for our 15s. If you go to the menu you will find a page dedicated to more comments about speakers and why you need to make good choices for your speakers as well as your amplifier. Virtuoso Series-dual channel with channel switching, overdrive, reverb and FX loop. Going through a major re-design. Based on our present schedule this won't be available for quite awhile yet. Challenger Series-Something new...something old. The case is all metal like the Challenger PAs of the '50s. The electronics are an interesting combination of classic and new. Coming soon. 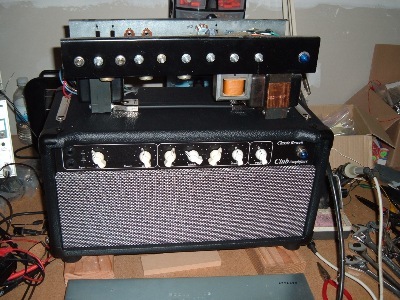 Until 2006 every Club Amp was custom built on a chassis fabricated in our shop. They weren't "pretty". To the left, a picture of a 2004 vintage chassis sitting on top of a 2009 Series II head. As you can see, my bench isn't very pretty either. Each amp was built for a local musician; someone we could sit with and talk to about what they wanted from their Club Amp. More than 90% of the time they wanted the basic attributes of a 1959 Fender Bassman or an early Marshall JTM45 or the classic Vox AC30. They didn't necessarily want the power of the Bassman. And, they didn't want a lot of "bells and whistles". Most played small clubs or did studio work. They wanted the best sonics possible. We build amps with the basics of a Bassman, but built for the small club environment. That's how we came to be "Club Amplifiers". We scaled the best of the Bassman to be used in a small club. In 2007 we started advertising. We can't sit with each customer any more. When we could it wasn't a big problem to have an ugly chassis. The customer was happy with the sound. The new Club Amps still have simple cosmetics, but they now look as good as they sound, built with a really strong professional chassis and very special transformers, made for us by a true magnets master. Club Amps are still semi-custom. We mainly build to order with the power, and the tubes client prefers. OK, we do offer some product on Ebay already built. Standard-classic guitar amp sonics__this transformer "sets the standard"
Yes, there are some decisions to be made when you buy a Club Amp. But, is it any different when you choose a guitar? Do you want a Strat, a Tele, a Les Paul, an ES-175, a PRS, a Dean, a Schecter, or maybe a hand-crafted custom? Which model? Which neck? Which finish? Which pickups? What type of strings and what gauge? Don't worry too much. We'll work with you. We hope to make it easier than choosing a guitar. For those who know what they want, let's talk. You've taken the first step. You're here at the website. The next step is an email. Talk to us. Let's explore what you need to sound your best.